A yummy twist on mashed potatoes—try celery root instead! And get this……it doesn’t taste like celery! My husband dislikes celery, yet he LOVES celery root. Make this mash as a side dish or as a main course with rosemary roasted veggies on top. No matter how you prepare them, they are awesome! Place peeled chunks of celery root in a medium sized saucepan. Pour the water into the pan, covering the celery root. Add more if needed in order to cover them all. Boil for 10-15 minutes or until celery root is tender. Remove from heat. While the celery root is still hot, add butter, milk and salt to the pan. Mash until smooth as possible. (I used a hand mixer for this, but you could use a potato masher or a fork). Mashed celery root isn’t as smooth as mashed potatoes, but it’s just as good! 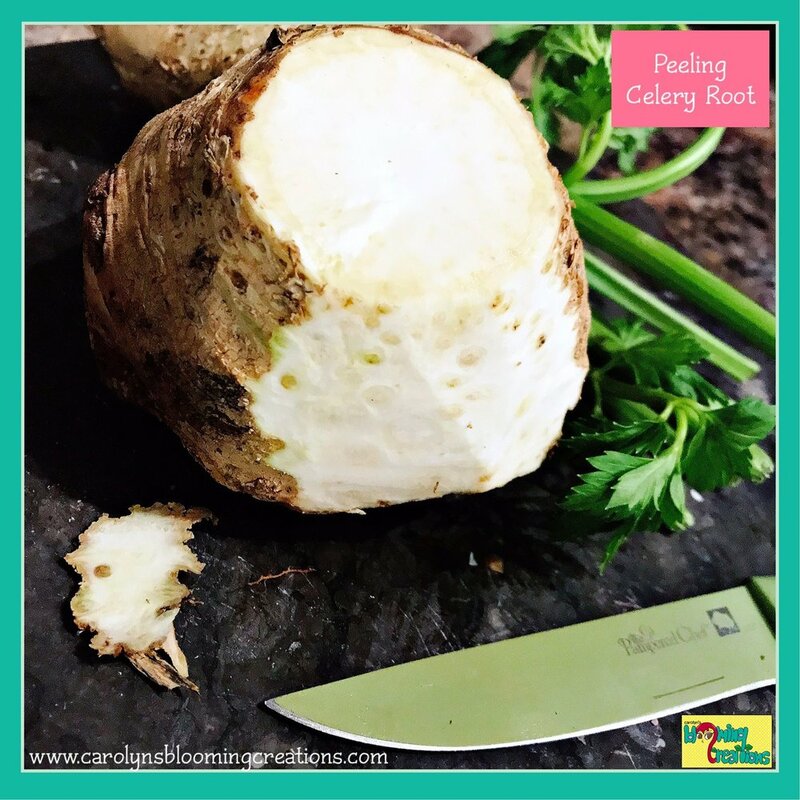 You can use a potato peeler to peel most celery roots. For those that you can’t use a peeler on, use a knife. See photo below. Add a few pieces of roasted garlic or a 1/2 teaspoon of garlic powder to the mash for a garlicky punch of flavor.